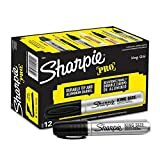 The Sharpie Pro King Size Permanent Marker is rugged for long-lasting durability. Specially made for industrial users, the bold black markers write on greasy, wet and oily surfaces, while the sturdy plastic barrel withstands heavy use. These permanent markers built tough with an extra-large ink supply and versatile chisel tip.